It is always fun for me to share stories of inspiring cats or humans. Jacey, Marley, and I think that we need to remind people that humans can be very loving and kind, because there are far too many stories of humans who do evil thinks like abusing animals. Yesterday was Halloween. I reminded you that on Halloween, it is best to be safe with your felines because there are some humans who would abuse them. But for Halloween, there are organizations that sponsor pet costume contests. One of my fellow hybrid cats won the contest, a savannah cat named Selani. 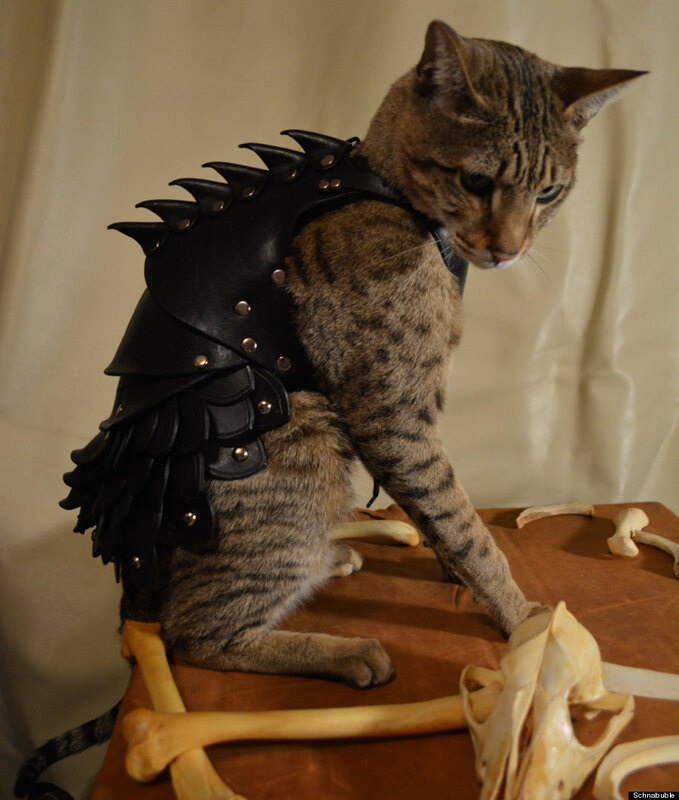 Selani was a five year old cat whose costume featured her looking fierce in battle armor. This custom costume was created by one of the humans Selani shared her home with. The battle armor was a fitting pet costume for Selani, because she was fighting a battle against lymphoma. On the day that she was entered into the contest, the battle armor and the best efforts of the humans in white coats were not enough. Selani lost her fight against that disease. Selani may have lost her fight against lymphoma, but she was about to become a winner in the pet costume contest. Initially, Selani’s humans shared her entry on Facebook. One of their friends posted it to Reddit, where it really took off. And that was enough to help Selani win the pet costume contest, with the prizes going to her humans. This does not seem right to me. The feline does all the work, and the humans benefit? I am okay with this, though, because in tribute to Selani, the humans who entered her photo into the pet costume contest decided that they would donate their winnings to a cat rescue organization. The Woburn Feral Cat Coalition will receive the grand prize, which is a year’s worth of noms from Hill’s Pet Nutrition. Selani may be gone, but through this act of generosity, her humans have ensured that she will help other felines. You know that as a diabetic cat, I share a bond with all the felines out there who are fighting that disease. Today I want to share the story of Guapo, who is fighting not just feline diabetes, but FIV. Guapo was a well taken care of cat, and his human adored him. Sadly, his human got sick, and is no longer able to take care of him. So Guapo, which means handsome in Spanish, had to go to a rescue. Pawsitive Karma Rescue, which is located near Austin, Texas, took in Guapo, raised money for his care, and found a group of humans in white coats who were willing to take in Guapo temporarily. Because of the declining health of his human, Guapo had not received the treatment he needed. He was suffering from a bacterial infection in both eyes, and he was diagnosed as a diabetic cat who also has FIV. Guapo is receiving treatment from the humans in white coats, and he is doing much better. His eye infection has cleared up, and he is become more active and more vocal. Guapo really loves attention and affection, and he enjoys giving it back. Thanks to some very generous humans who donated those green paper things to Pawsitive Karma, Guapo’s medical and boarding expenses are being taken care of. But Guapo cannot stay with the humans with with coats forever. He needs to find a foster home, or even better a furever home. The human who ends up with Guapo will find he is a very friendly feline. He loves to be brushed and pet, especially around his chin and cheeks. And he is crazy about catnip. Bring out the catnip and this feline will roll around in it like a young little kitten! Pawsitive Karma has been able to raise money for Guapo’s care, and they have many volunteers who are happy to help with treating him. But they cannot find him a foster or furever home. Can you help my fellow diabetic cat?